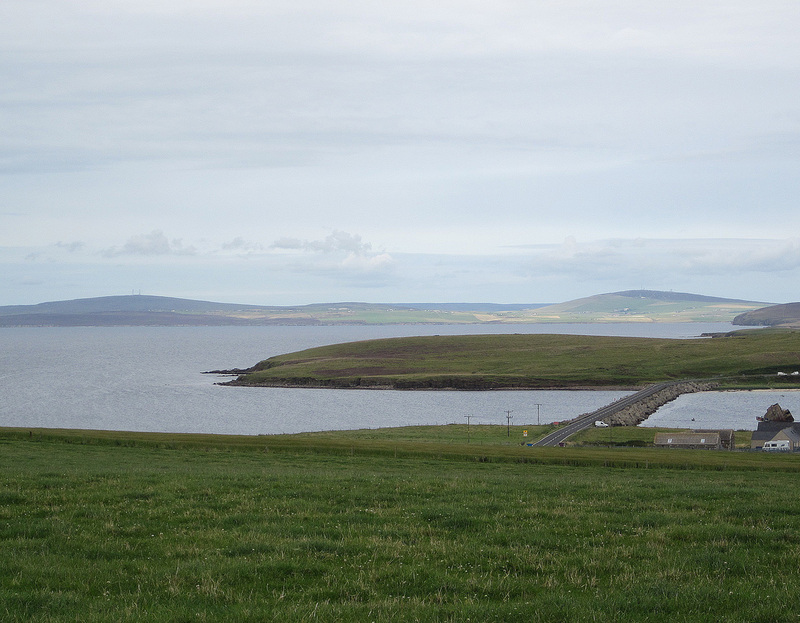 Dottore Gianni’s trip to the Orkneys was as incredible a journey, in a quite different way, as that of the day before on Skye. This journey was longer, a large tour bus taking us all the way to John o’ Groats, one of the few places where ferries take passengers from the British mainland to the Orkney Isles. or just a tourist trap? 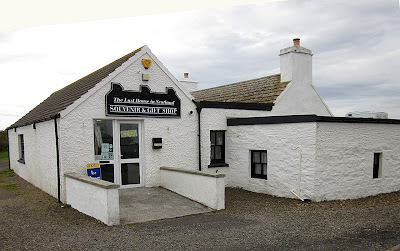 It’s a full three hour bus ride just to the ferry, then a 45 minute ride across the North Sea to the “mainland” of the isles which is an island itself, only much larger than the other islands that comprise the Orkneys. In the “highlights” tour I booked, another tour bus picks the passengers up when the ferry lands, and off you go on a six-hour tour with stopping points to some of the most famous sights/sites of the mainland/island. It is designed in a smart, compact manner, a very well planned fourteen hours. The bus left the Inverness station at exactly 7:30 am. As I noted above, it was a large tour bus, equipped with as much in the way of facilities as large tour buses can bear. I don’t usually travel on bus tours, but one thing I remembered was that there is a toilet on board. Given my needs, I decided to seat myself near it. Above the toilet was an area where our hostess, a young Scottish lass that I’d have taken for not more than fifteen years old had I seen her on the streets, fixed coffee and tea for passengers, as well as snacks and drinks of other kinds kept in a variety of interesting mystery boxes. I watched her as she worked in a very skilled manner under difficult circumstances. Getting around on board a bus, especially one coursing through a place like the highlands, with hairpin turns and tons of bumps, cannot be easy. A note to remember if you’ve not traveled on a tour bus. Do NOT seat yourself near the toilet! Ghastly odors emanate from the toilet! In short order after the bus bounced away from Inverness, four old people made the trip, each on the heels of the one before, and judging from the vile smells I can only imagine what in the name of god they must have had for supper the night before…spicy curries? Sausage and mash? Bean soup? Worse? I was so repulsed that I determined to make it to the ferry terminal, which had roomier and more private facilities, before I attempted any of my own…eliminations. I really believe that most other passengers felt the same way, as after the first four, few others ventured anywhere near the place. In fact the young hostess had to enter it to put more toilet paper in, and another worker for the bus company, who happened to be seated not far from me, whipped out a spray can of Glade or some similar “freshener” for her to use before she entered the contamination zone. She politely refused his offer, but as soon as she closed the door, mission accomplished, he sprayed the area anyway. Thank God! Other than that noxious nuisance there was much to enjoy during the bus ride. We hugged the eastern coast of northern Scotland, which is startlingly beautiful. The hostess provided commentary as well, though it seemed as if she was reading it from a script rather than telling stories. Still, she provided information I’d never have got otherwise, even if it was delivered in a programmed, perfunctory manner. She showed us young seals on the banks of some of the lochs, also noting that dolphins can often be spotted, though none of those appeared on our trip. She pointed out distilleries, including Dalmore and Glenmorangie, and another I’d not heard of, Clynelish, which exports most of its single malt. She also noted the northernmost distillery on the mainland, Old Poultney. When she spoke of the Dalmore, she noted that while in casks a small amount of whiskey is lost to evaporation – this is called “the angels’ share,” which the distillers think of as their loss and the angels’ and the customers’ gain – because of this “heavenly thirst” fewer than 1,000 bottles of the 40 year old variety have been created. She told us the story of Sutherland County, the least populated county in Scotland, averaging two residents per square kilometer, where sheep outnumber the people ten to one. She explained the cause for this when she pointed out the 100-foot statue of the Earl of Sutherland, that he himself created in honor of…himself. It’s very good to be the earl. But not his people. Today there is still clamor to tear it down or set it afire, because the not-so-good earl along with other wealthy landowners realized that they could make more money from sheep than from taxing the people who lived on and worked their land. The result? The Highland clearances, a nightmarish evacuation of thousands who no longer had the means to live. And she offered information on other landmarks, castles and cattle, and the city of Wick, home to Old Poultney scotch and also at one time the center of a major herring industry, last but not least home to what the Guinness Book of Records acknowledges as the shortest street in the world! Some of this may seem rather silly, but her observations really helped the long journey seem somewhat shorter than it was. The trip is timed to the ferry, and the ferry waits when it has to, as the buses provide most of its passengers. 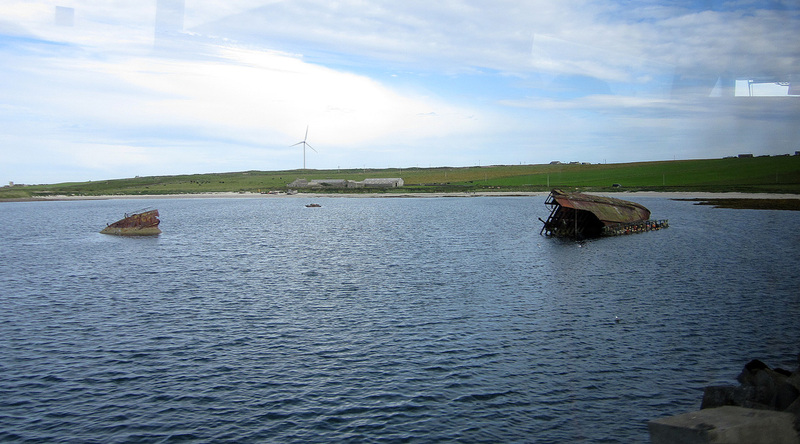 But we passengers had to wait at least ten minutes for the ferry this time around, as it was inexplicably delayed, and when we finally got going the rather dilapidated looking vessel took longer than the usual amount of time to get us to the Orkneys. 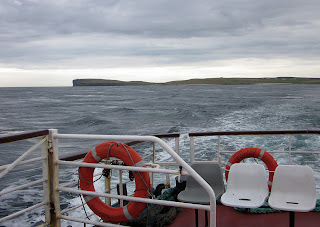 It was a gentle enough journey, and not unpleasant, but the delay did cut down our valuable time on the isles. The buses were waiting for us, and bustled us off as soon as possible on our journey. These buses too were large affairs, though without toilets, which was just as well in my book. The driver was also the tour guide, a large, grizzled old fellow who was really quite good, much more energized that the young lass on the bus to the ferry. He was full of information and delivered it in an off-the-cuff, humorous manner. 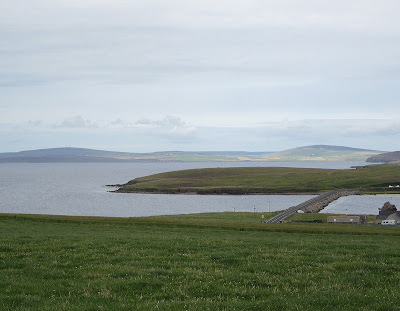 The first of our highlights was Scapa Flow, a large body of water whose history of use by navies dates back to the time of the Vikings. It is primarily known, however for actions in the both world wars. Our guide was a former member of the Royal Navy, and had many stories to tell us, including when early in World War II a British battleship was sunk due to the disrepair of the defenses against U-boats. The First Lord of the Admiralty, Winston Churchill, ordered strong barriers built to prevent further attacks. Much of the labor utilized to accomplish this task was performed unwillingly by Italian prisoners of war. 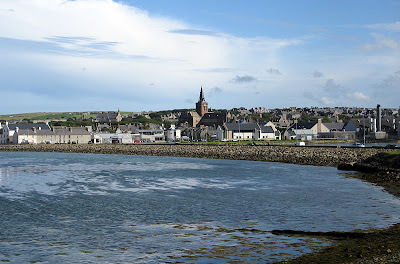 From Scapa Flow we motored to the largest city in the Orkneys, Kirkwall. 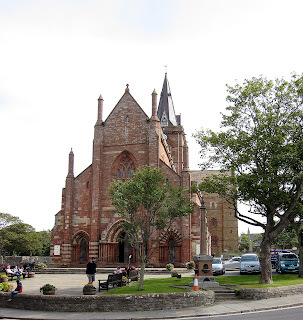 also a good museum of Orcadian life and history (I visited cathedral and museum briefly), charming shops and a harbor filled with fishing boats but which welcomes cruise ships as well. Our guide noted that it might be smart to check your calendar for a visit to Kirkwall against cruise ship landings, as the smallish city can be completely overrun by hordes of cruisers, characters far more difficult to deal with than Vikings, particularly when shopping for souvenirs. We had a quick lunch stop in that town, and I ordered out from a classy little sandwich shop called The Reel, which focuses on music, offering lessons as well as performances. I ordered a chicken sandwich, and the chicken turned out to be delicious, chunks of breast meat with a hint of lemon on a bed of lettuce. Happy surprise! Kirkwall is also home to Highland Park, one of my favorite single malt scotches. Sadly the distillery is just out of town and I would never have been able to make it back to the bus had I chosen to visit. Our loquacious driver told a fine story on Magnus Eunson, the man who according more to legend than fact first concocted the whisky in the late eighteenth century. He sold his wares illegally and the authorities knew it, but they could never find his “still.” It seems he was a church elder and used a chamber just under the church’s altar to store the distilling equipment! Sky, sea, barren hills – unique, but also essential to the survival of ancient sites. If there is no wood, how does one build shelter? 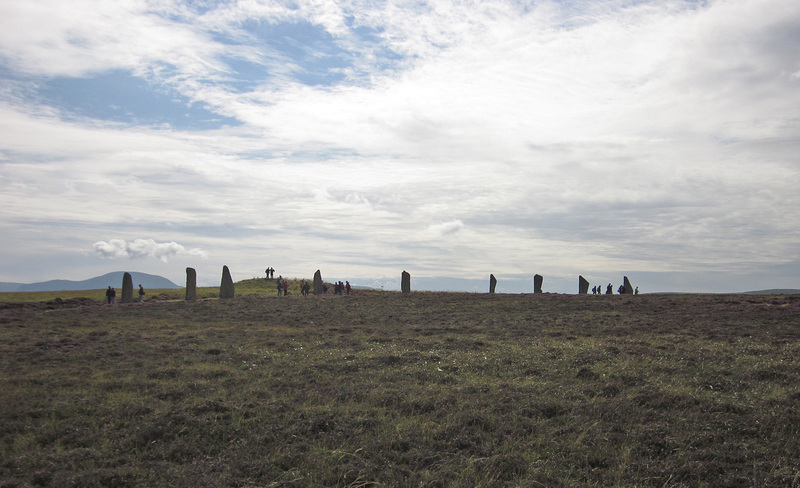 Stone is one such material, and the kind of stone found on the Orkneys is relatively easy to cut and shape. It also lasts longer than wood, which is why the 5,000 year old Skara Brae has lasted longer with more elements intact than other surviving Neolithic sites. 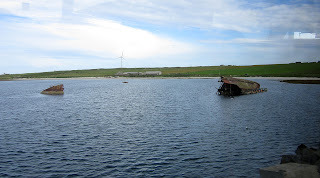 Seeing Skara Brae was the deal breaker – the main reason I decided to take the long day trip to the Orkneys. 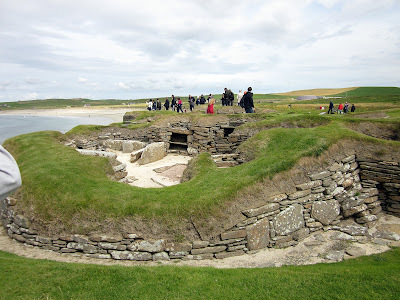 I have seen many old sites, but at Skara Brae I experienced a feeling impossible to explain. The ancient village sits in a beautiful, small natural harbor. When I looked out at the sea from the Skara Brae I sensed the durability and adaptability of the human race. It made me feel more human and more alive, feelings Dottore Gianni feeds on and reaches out for more than ever these days, as la vita e troppo breve. Outlines of ancient buildings near the sea. Another means of taking one’s breath away. Skara Brae is only one of many discoveries in the Orkneys. 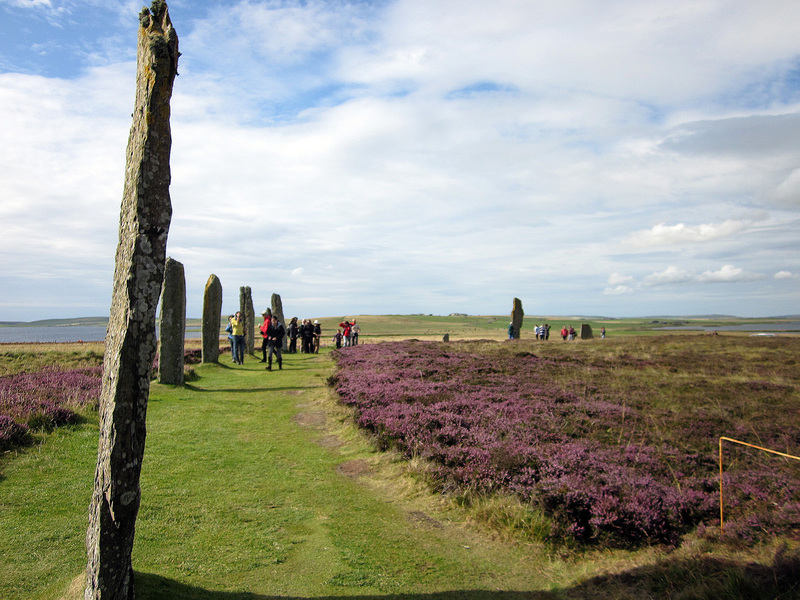 It was come upon after a really strong storm hit the Orkneys in the mid-nineteenth century. 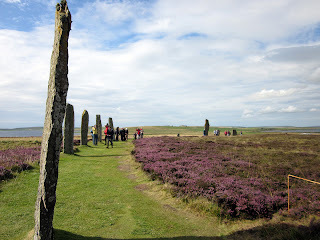 More recently and very near the site of Skara Brae the Cairn of Maeshowe, the Standing Stones of Stennis and the Ring of Brodgar are proving feasts for archeologists, and all of them have been named a World Heritage Site by the U.N., the Heart of Neolithic Orkney. We stopped at the Ring of Brodgar for a short photo opportunity, and our driver told us something of the others as we drove past them. Only one more “highlight” remained, and at this point we were more or less racing towards our ferry to the mainland. 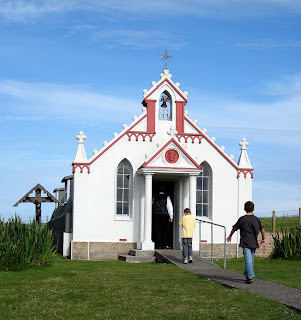 But the short stop at the so-called Italian Chapel was fascinating. This lovely little church was built by Italian prisoners of war during World War II as a labor of love, as opposed to their forced labor building the Churchill Barriers on Scapa Flow; a most unusual task, but very likely one that lifted spirits in a dark time; touching, no matter which side of the war you were on. Quick photos, back on the bus, and on to the ferry. A whirlwind tour, and all I could hope for on this particular highland fling. But of course such a tour leaves one wanting a good bit more. Perhaps that’s the intention. On the bus ride back the sandwiches we had ordered on the way to the Orkneys were delivered. I had a tuna and cucumber on delicious wheat bread. Then I sat back, put on my headset and mixed Haydn with Highlands – there was something about that particular blend of beautiful music and wonderful scenery that put a perfect cap on my journey. Haydn in the Highlands? I would like to be doin' just that, lads and lasses!